Handmade Pasta is easier than you think with just 4 simple ingredients! Avocados lend the recipe fiber and a fun green color. 1. For the avocado pasta: In a small bowl, whisk together avocado and water. 2. Place the flour on a clean surface and mix with salt. Create a well in the center and add avocado mixture. 3. Using a fork, slowly incorporate flour into avocado mixture until a dough forms. 4. Have your child help with kneading the dough. 5. Knead for 10 minutes on a lightly floured surface, until dough is smooth. If dough becomes too dry, add a little water. If dough becomes too wet, add a little flour. Form into a disc and refrigerate for 15 minutes. 6. Cut the dough into 4 pieces. On a clean surface, dusted with flour, roll out 1 piece of pasta dough at a time. Roll in one direction to make a long sheet. Dough should be almost see through. 7. Dust sheet with flour. Starting with the shorter end, roll dough upon itself. Cut into desired thickness. Repeat with remaining pieces. Set aside. 8. Bring a medium pot of water to a boil. 9. For the vegan cream sauce: Heat oil in a medium saucepan over medium heat. Add onions and sauté for 1 minute. Add garlic and sauté for an additional minute. 10. Stir in flour and continue cooking for 1 minute. 11. Slowly whisk in almondmilk. Continue whisking until thickened, about 2 minutes. Add tomatoes, salt and spices. Continue cooking for 2 minutes. Keep warm. 12. Working in batches, cook pasta in boiling water for 1-2 minutes. Drain and place in a large bowl. 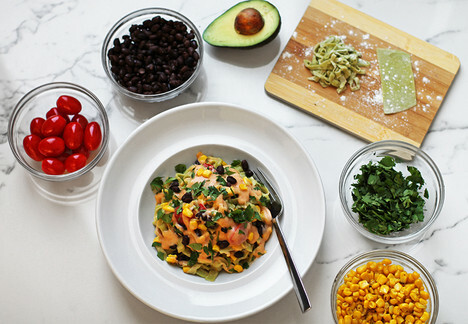 Toss together with sauce, black beans, corn and cilantro. Serve immediately.